One thing that is certain with North Carolina retail is that planning for retail development, notably malls, is complicated. 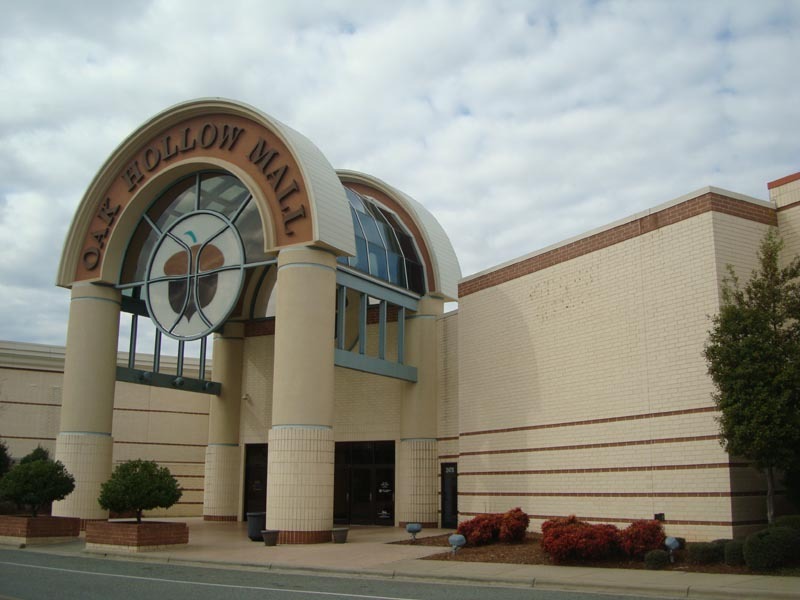 Instead of a couple large cities, the state is full of smaller cities that form several collective metropolitan areas such as the Triad, where Oak Hollow Mall is located. 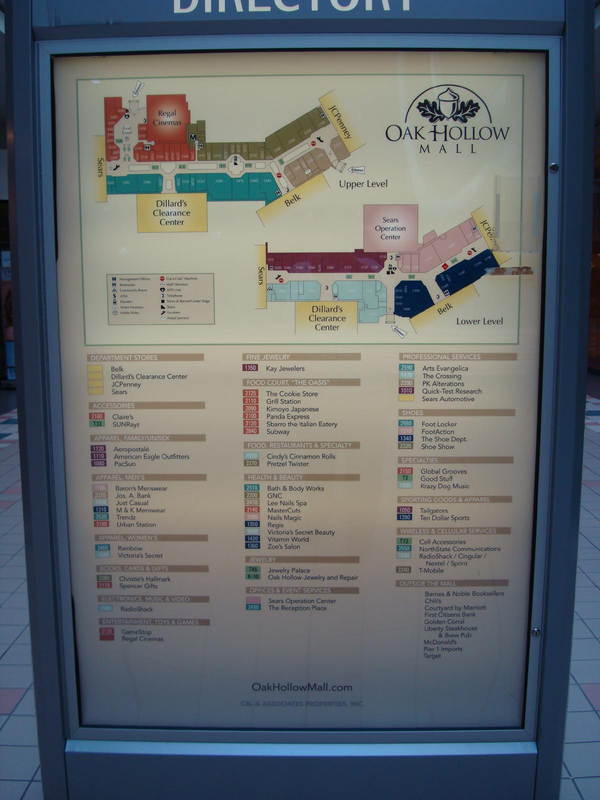 More specifically, Oak Hollow Mall is located in High Point, the smallest of the three cities in the Triad as well as the city struggling the most economically of the three . When the mall opened on August 9, 1995, it opened at the end of the mall era with great expectations of being a regional powerhouse sporting an enormous 1.3 million square feet. 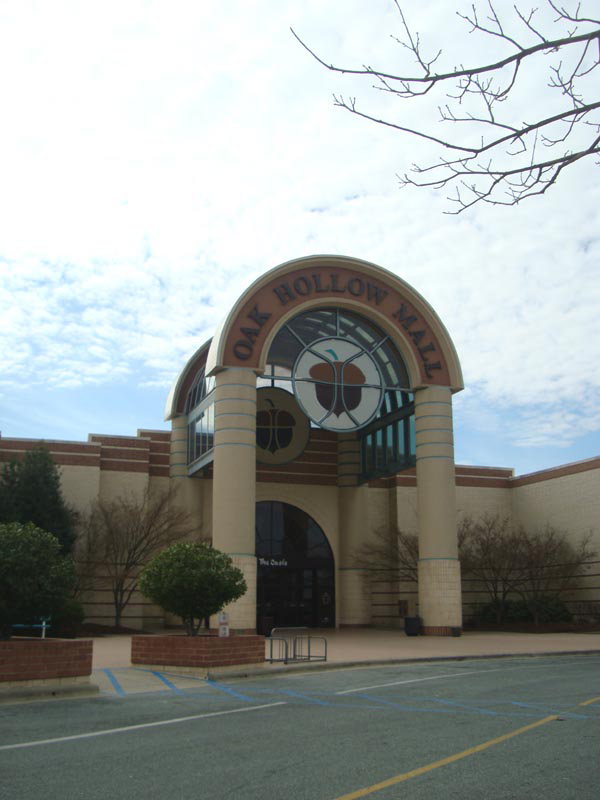 When built, Oak Hollow also competed indirectly with two malls in Winston-Salem and directly with Friendly Center, an enormous outdoor shopping center in Greensboro. Building a large mall, however, did not exactly increase the appeal of High Point, and the area surrounding the mall has not developed much since it opened. 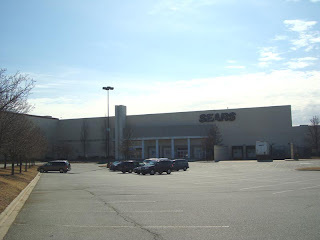 The result is that the newest mall in the region is also a dying mall, and on February 24, 2011 it was sold to High Point University ultimately sealing the mall's fate. The first photo shows center court with the elevator. 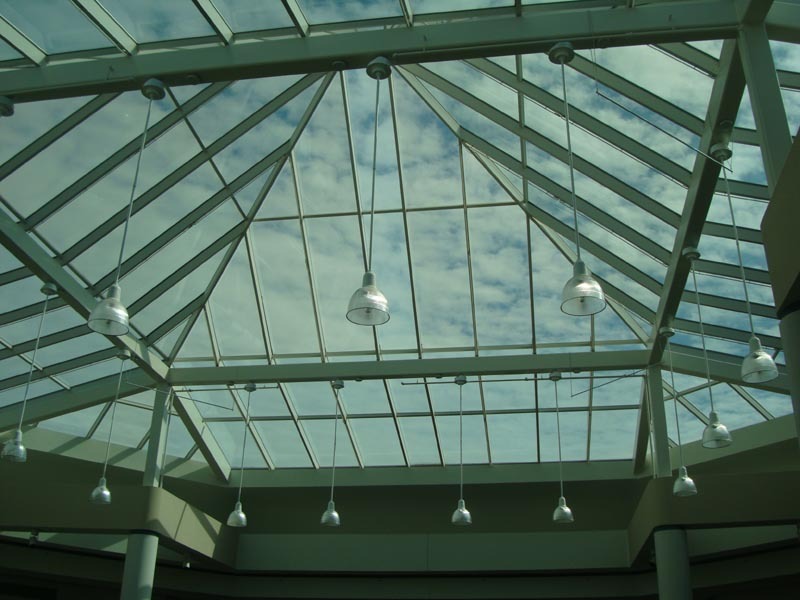 The second photo here provides excellent detail of the skylights with the high clouds giving a dreamy effect. While not the most impressive, it certainly is not hideous either and this mall is pure 90's. Many elements of this mall remind me a stripped down version of North Point Mall in Alpharetta, GA. This and all photos published here by digitalsky. I guess if the mall had been doing better, the palm trees would have been long gone by now. Exactly why were trees removed from most malls? Palms especially are interesting in the Piedmont since they do not grow there naturally. Photo by digitalsky. 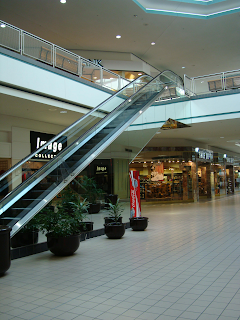 A view of the lower level shows a few chain stores still around. It reminds me of the waning days of Century Plaza in how fast the mall is dying. Photo by digitalsky. Escalators with mirrored sides apparently all the rage in the 90's. So were snap bracelets, bowl cuts and soccer shorts for casual wear. Photo by digitalsky. 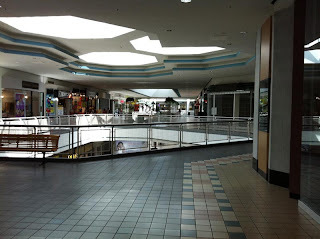 This image proves that even newer malls are spooky when they die. Imagine how this scene wood look with brown tiles and dark wood trim. Photo by digitalsky. This mall map presents a mall as healthy as a double bacon cheeseburger with a side of onion rings. It hasn't quite gotten to the milkshake yet, but it's coming for desert. The sale to the university is definitely the "special sauce" on the burger. Photo by digitalsky. When the mall opened, the anchor lineup was promising. Belk Beck, Dillard's, JCPenney, Sears and Goody's provided a new upgraded shopping experience for the city. Shoppers previously flocked to Westchester Mall, an older, smaller mall built in 1970 that quickly died after Oak Hollow opened. Both Belk Beck and JCPenney left Westchester for the mall leaving the older mall anchorless since Thalhimer's had already long since closed. With only one level, a dated layout and three anchors the mall was incapable of competing with such a large mall closing later that year. 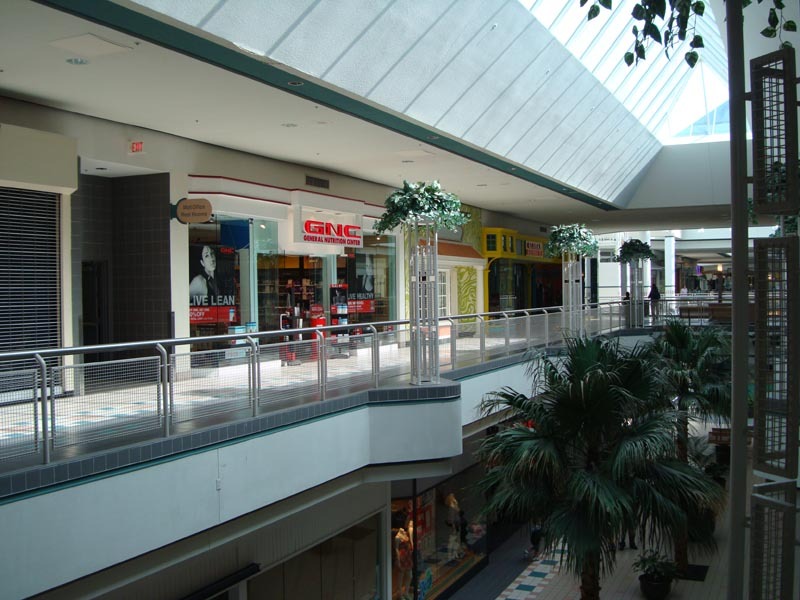 Sadly, Westchester Mall was the right size for the city as well as being better located to capture High Point shoppers exclusively while the current mall has faced more direct competition. 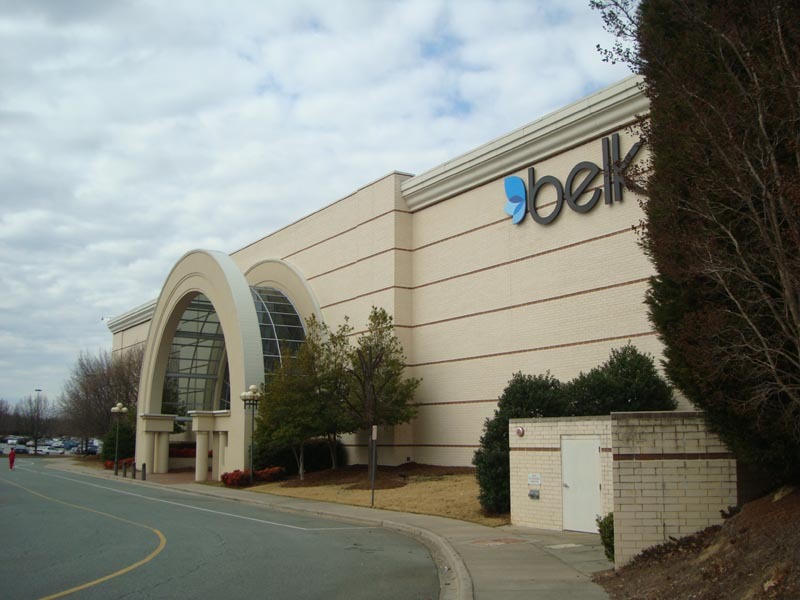 You would think the mall's declining fortunes would have resulted in Belk saving the money on rebranding some of its stores, but when even Eden Mall gets a new sign they aren't going to let it show. Photo by digitalsky. Dillard's tends to close the upper level when they downgrade to a clearance store. You tend to wonder why they take this intermediate step. Are they just stuck in a lease? Photo by digitalsky. Inside the Dillard's upper level. Photo by digitalsky. 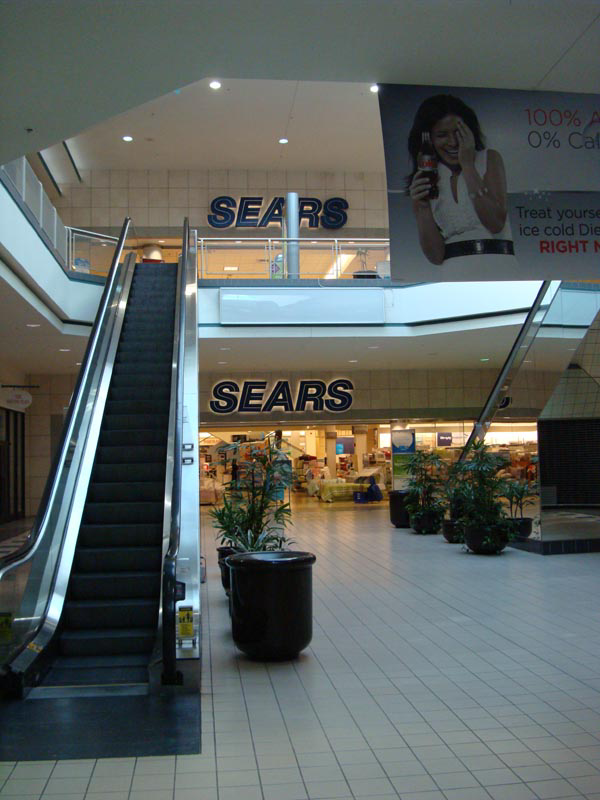 Goody's former mall entrance, now an unmarked entrance to Sears Operations Center. Goody's, later Steve & Barry's University Sportswear, was only one level, and the entrance is there obviously for employees to enjoy what is left of the mall on their break. Photo by digitalsky. A former Express store on the upper level. Photo by digitalsky. 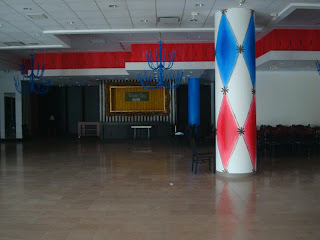 Inside the former Express store with all-American colors. Photo by digitalsky. 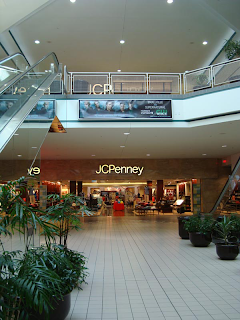 While Westchester complimented other malls in the region, all of the major shopping centers strongly reacted to the opening of Oak Hollow Mall. Four Seasons Town Centre added a third level. 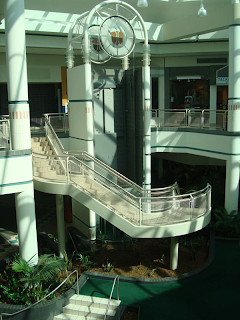 Carolina Circle Mall in Greensboro, already struggling, faded into history. The most direct blow, however, came when Friendly Center greatly expanded with a new outdoor "lifestyle center" addition (though the center technically was one to start with) in October 2006 further drawing shoppers away from the mall. It was clear that unlike the earlier Westchester Mall, other shopping centers saw Oak Hollow as a threat, and their reactionary improvements began the downward spiral at the mall. The anchor overlap also was a problem with Dillard's and JCPenney also at Four Seasons. 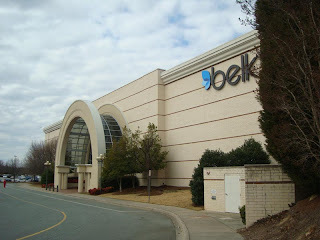 Belk was also at Four Seasons as well, but also located at Friendly Center not that far away. Not attracting a Macy's also lowered the long-term appeal of the mall. Macy's not having a presence at the mall was peculiar enough since Westchester had Thalhimer's, which was destined through mergers to ultimately become Macy's anyway. 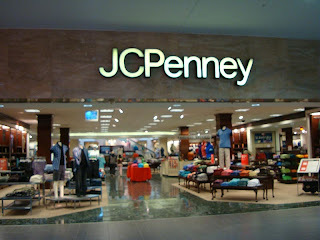 With JCPenney closing shortly, I am adding more photos than usual of the entrance. 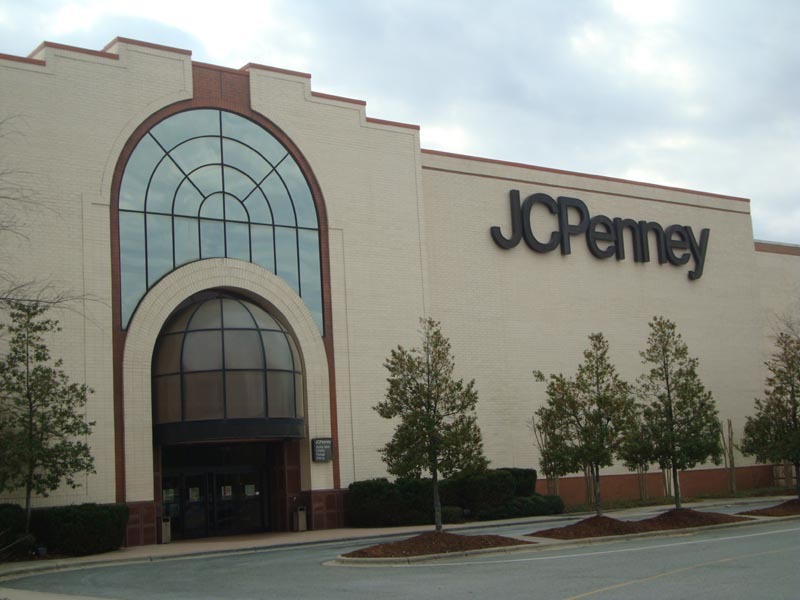 JCPenney built its most attractive stores in the 1990's compared to the Target-inspired look they are obsessed with today. Photo by digitalsky. 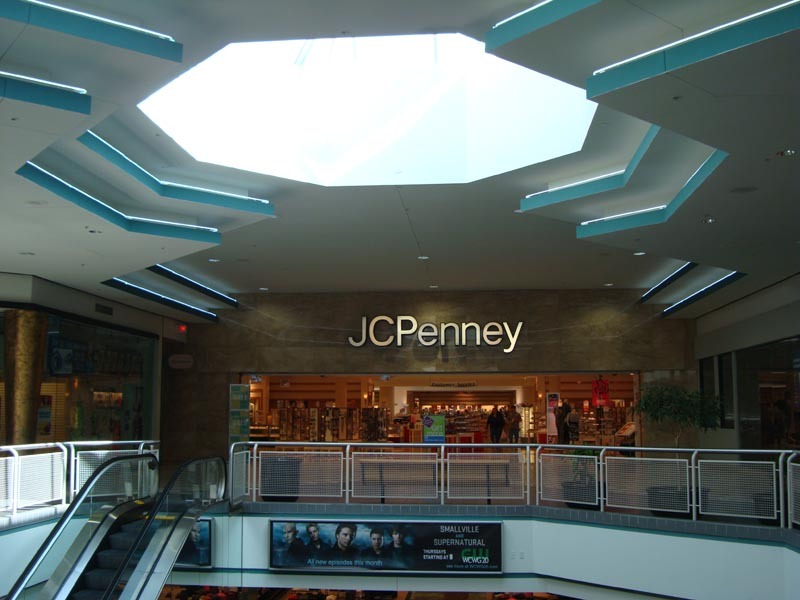 JCPenney upper level entrance with neon and octagon skylights there to make you feel like you are about to be abducted by a UFO. Photo by digitalsky. 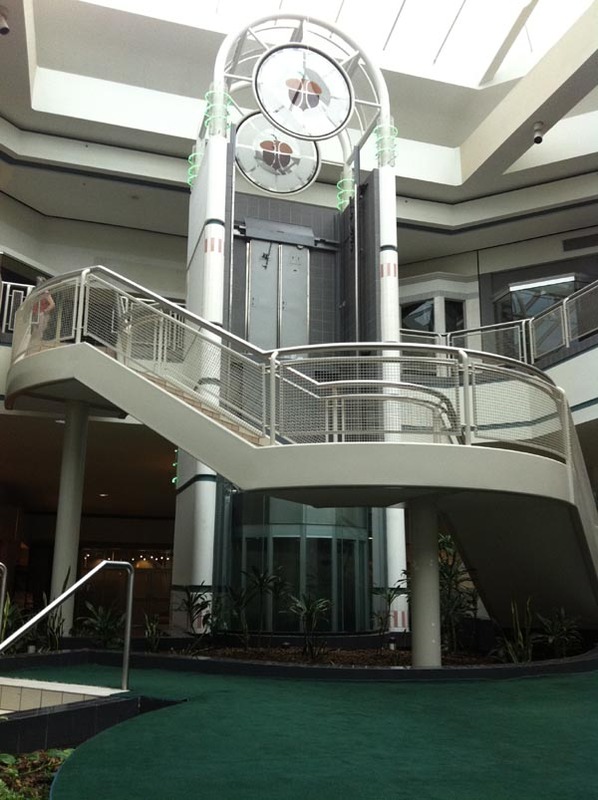 Here is close-up detail of the upper and lower level mall entrances, respectively giving a glimpse into the inside of the stores. The dark green fake marble flooring is tasteful. Photos by digitalsky. American Eagle...absolutely essential for at least a marginally successful mall. Rolls of brown paper...absolutely essential to hide the insides when management won't spring for termporary white walls. Photo by digitalsky. Sears, of course, will be here to shut out the lights when everybody else is gone: at least store-wise. Photo by digitalsky. Oak Hollow Mall is a very young mall to be so troubled. Its problems became apparent before the mall even reached 15 years old. The first was more subtle when Goody's closed at the mall. I cannot confirm the date, but it appears to have been in early 2008 awhile before the company liquidated. Steve & Barry's University Sportswear briefly took over the spot before that company also folded in 2008. On December 8, 2009 Sears relocated its customer service center in that location after Steve & Barry's left. What came next, though, was more ominous with Dillard's converting to a clearance store in November 2009. The worst news of all, however, came on January 24, 2011 when JCPenney decided to ax its store at the mall with the store closing its doors by June 1st. 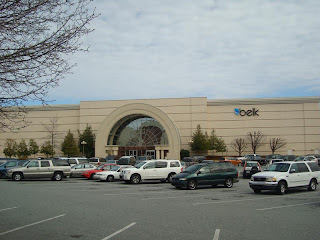 On February 11, 2011, Belk added insult to injury announced that is mulling closing its location at the mall as well. However, Belk has had a long presence in High Point and also mentioned that it would open a new location at High Point if they closed at the mall. Too bad reopening its store at Westchester Mall is not in the cards. 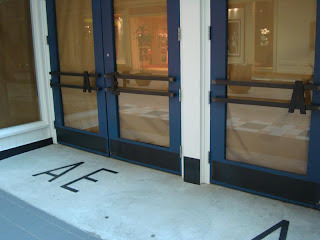 This is why I generally hate it when they renovate malls: this mall entrance looks rather distinctive. When places are original, they have the unique, personal touches intended by the original architects. Photo by digitalsky. I really do like the mall entrances from the outside a lot. 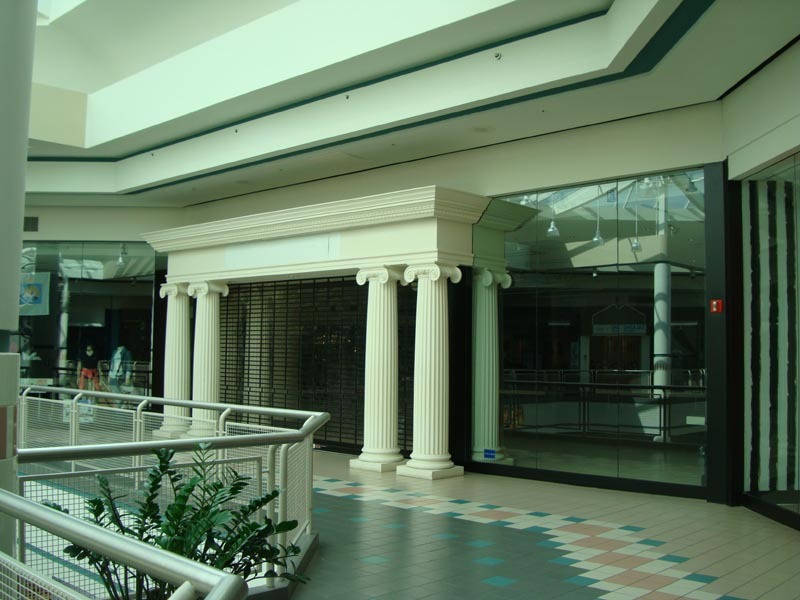 The 90's was the beginning of more elaborate mall entrances compared to the typically impersonal boxes found in 70's and 80's malls. That was one thing that did improve in mall design. 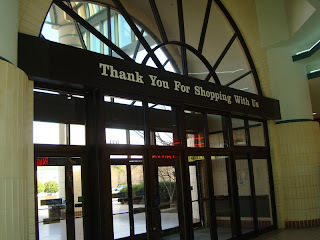 The best part is that the mall logo is not in lower case letters in the same font that used in every other logo today. Photos by digitalsky. Fortunately, hungry shoppers will find the food court has held onto some chain restaurants including Subway, Panda Express and Sbarro. 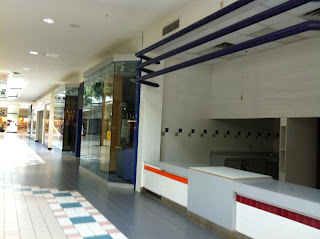 When these pictures were taken, it appeared it hadn't yet gotten to the level yet where the only place to eat in the mall is some local dig named something like Annie's Hot Dogs. Photo by digitalsky. Sears aimed for a generic design in the 90's with this store pretty much a clone of the store added onto Riverchase Galleria around the same time. Photo by digitalsky. The 90's was also a time that putting a retro plaque on the door was popular as a way to show the strength and proud history of a company. That doesn't seem to be working much for younger shoppers, though. Photo by digitalsky. Now with the mall in crisis, the value of the mall plummeted finally triggering the sale to the university. 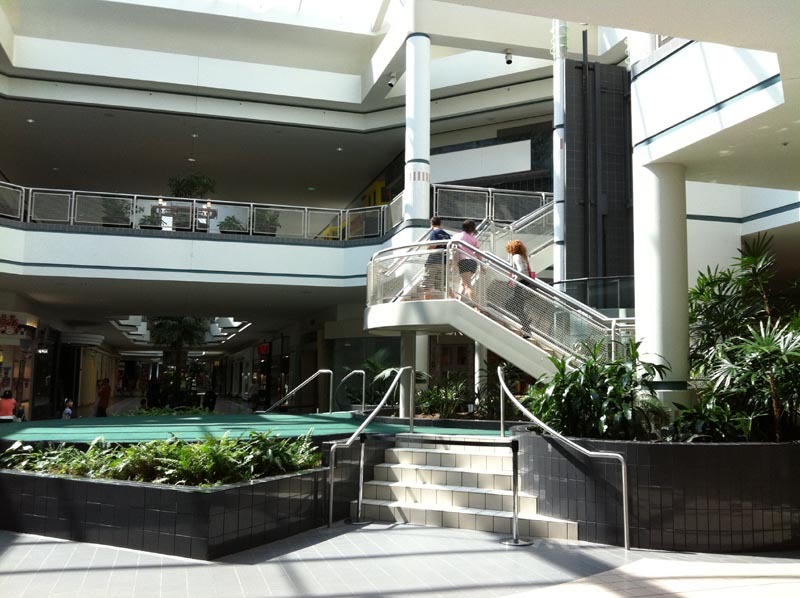 Selling at only $9 million, it is clear that despite the continued presence of Belk, Sears and a Dillard's Clearance Center that the mall has reached the end of its life as a retail center only 15 years after opening. In all, it is rather curious since CBL also owns the highly successful Hanes Mall in Winston-Salem why this property became a troubled asset for them. CBL still manages the mall despite the sale, but this agreement will likely terminate once all the anchors and inline tenants depart. 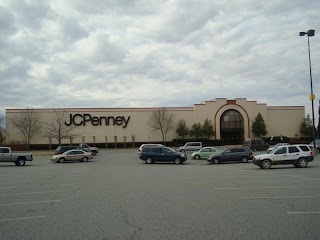 Here are a couple views of JCPenney from the outside. It is rather odd to see them depart considering they moved here from Westchester Mall and have been part of the city for years. Photos by digitalsky. Belk, which opened as Belk Beck, looks odd with the new logo. The logo looks too small for the building. 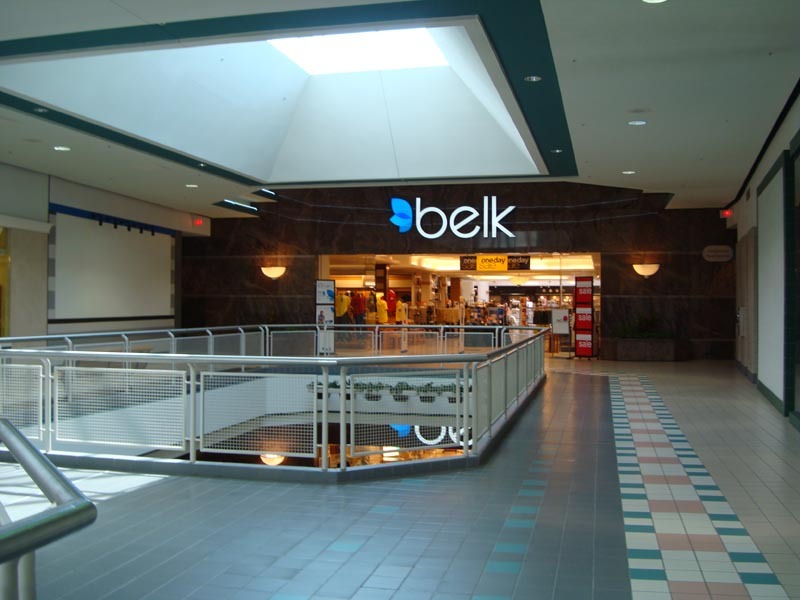 It is definitely not one of my favorite Belk designs with its gaudy horizontal stripes. Photos by digitalsky. Dillard's in its ugliest era. I bet if Ivey's had still been around when the mall was built they would have made this store look so much better. Photo by digitalsky. Sears Operations Center definitely has the Goody's signatures on the outside. They did a nice job covering up where the "G" used to be. Photo by digitalsky. Seeing how quickly High Point's retail jewel lost its shimmer, I have to wonder how different things would have been had it never been built and Westchester remained the only game in town. Unfortunately, Westchester Mall is now a church, but I wonder if they would let it convert back to a mall if the price was right. The word on the street, though, is that the city itself is failing, so possibly that mall's death would have only been postponed if Oak Hollow had not stolen its soul 15 years ago (before it was born again as a church)! Four Seasons Town Centre itself has struggled partly due to this mall, so maybe its departure will give it the shot in the arm it needs. 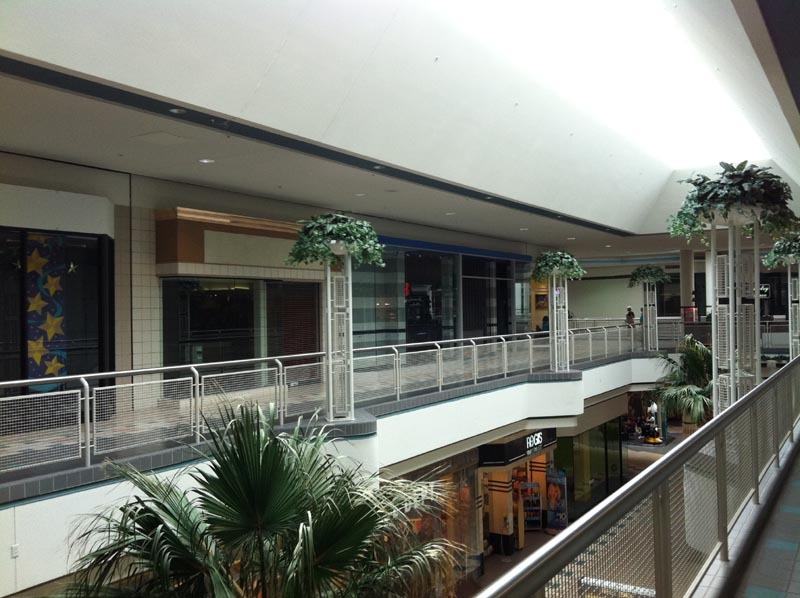 In the next couple years, Oak Hollow Mall will fade into history like a wrinkle in time, but maybe a silver lining can be found in the death of a mall that obviously was not too big to fail. 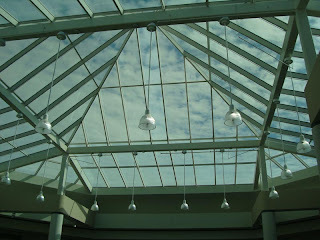 The mall also has some 70's sensibilities about it such as these octagonal skylights. Detail on the upper level back in the days when mall developers realized there were more colors available for flooring than slate and light tan. Another 70's throwback...green astroturf in the center court. Palm trees grace the lower level. I remember when Town Center at Cobb near Atlanta had those when it first opened in the 80's. This is a most beautiful pic. Mike Kalasnik states that this reminds him of now-defunct Eastland Mall in Charlotte. From this angle, I at least agree in regards to the steps. This is the last view on the upper level, but I can't tell which department store that is on the right. Never liked this mall. Something about it seemed like it wasn't going to work. I love how the Express store still had the Structure pillars in place....haven't seen those in years! I might visit in a few weeks. This looks like an awesome mall to go to if you like dying malls. The reason the mall failed is because of its greedy, lying, crooked owners had nothing to do with the retail stores. 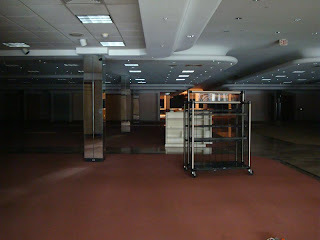 The owners still have a part in the mall even though they no longer own it because they are that crooked. They were horrible to their employees and lied to them as well. One day these people will pay for what they have done to so many lives putting them out of a job and lying like they did to keep them from drawing unemployment. 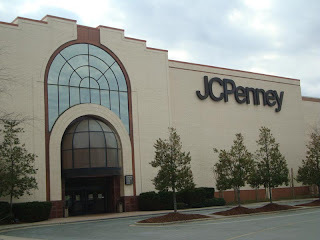 They are horrible and they own other malls in other states and here in NC. Hanes Mall is one of theirs. They are the worst people in the world to deal with because they have the devil on their side in full armour. It's surprising since it was very much alive when I lived in the Triad area in 2000-2002. The mall even had a theater at the Food Court, which I didn't see you mention. I guess it must have fallen off a cliff when the economy turned in 2008. That's Dillard's on the right in the last photo. Everyone has terrible things to say about this mall if they are not natives to the area, I am sure. Not many may like to go to it now, and it may have ALWAYS been doomed to fail from the beginning. I love the structure, the uniqueness of this entire building. I especially love strolling through when the holidays near, the seasonal lights and wreaths are not absent, but are hung from the ceiling of the top floor. As soon as I take in the first breath of the air walking in this mall, nostalgia slaps me, it makes me weak in the knees, for a few seconds I hold a secure notion-of what my real dreams are, like they have already come true. One of my only longings for the present and future High Point, is the availability of this attraction to the public, no matter what happens. 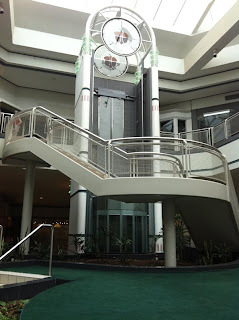 This article and these photos, totally capture the beautiful architecture of this monument, and honest essence of everything that this mall has been for myself and many others. So mind you, that though it seemingly may not offer much to you, it still means a lot to a handful of natives that still reside in the area, and we still believe in supporting it while remaining businesses still stand. You're preaching to the choir here...me and others who support Sky City are pretty sentimental about most of these malls, and seeing the similarities of this mall to a mall near me is depressing. The decline and death of so many malls including ones that appeared to have promise is a big reason why I keep doing this. I want to preserve these places as much as possible in everyone's memory before it's too late to see them or remember them. NC's Piedmont mall market is very saturated, and this mall did not have a town strong enough to support it. I hate to see it go, but the mall was simply too big in an area of declining fortunes. It would be nice if Mayor Smothers would be sent out there and the Mayors Office put in the abandoned Hot Dog Joint that poisened all those woodbe shoppers! I say good ridence to another epitemy of high point and what a craphole it was! 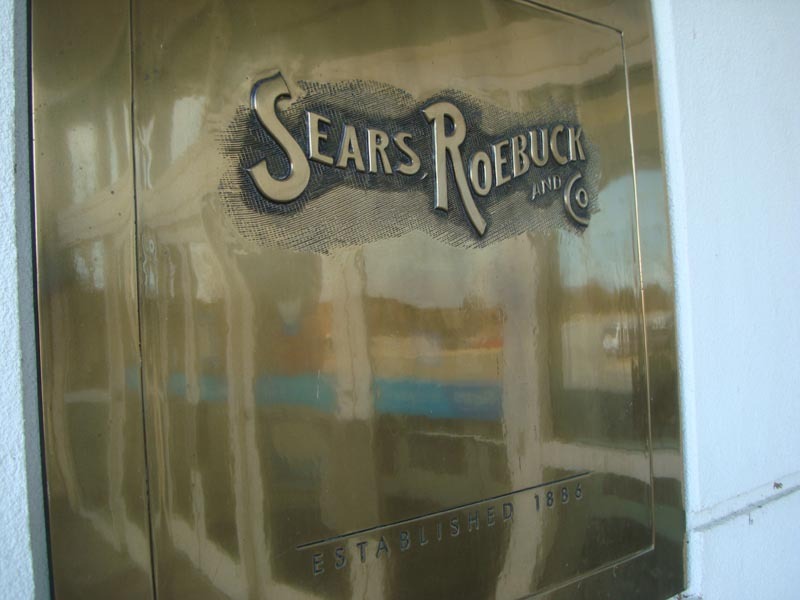 And I can't think of a better place for Sears to die in! And it can't be to soon for that nasty SEARS place! 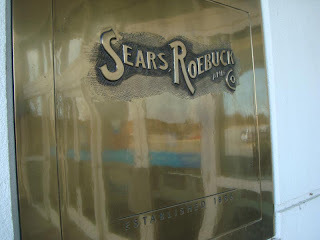 And for the record Sears Credit is now owned by The Hong Kong Bank and Trust of Shanghi so si'o'nora you crooks! I have never heard so much depressing ideological self-fulfilling prophecy and criticism especially from the host/owner of the site. 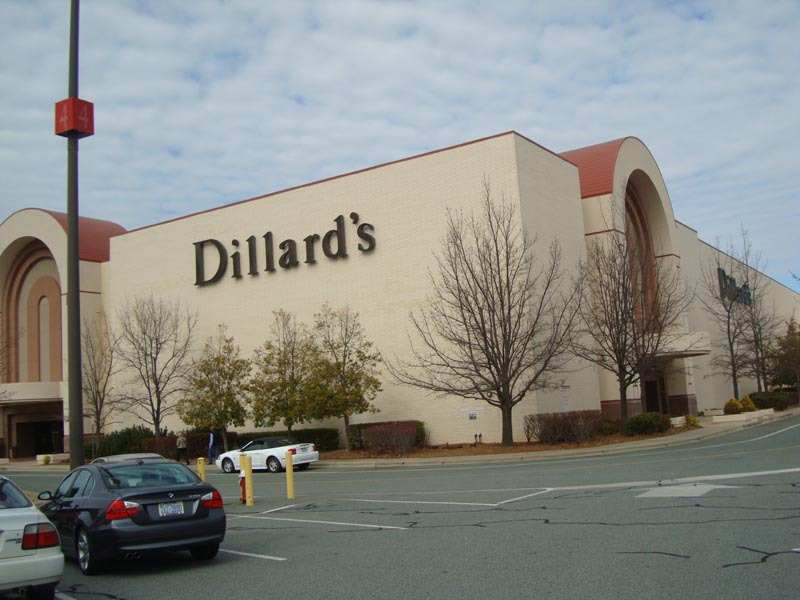 The Dillard's concept of changing to an outlet/discounted sales is just what a depressed economy needs, just as Family Dollar, Dollar General and Dollar Tree have found. Fill the mall with more outlet anchor stores selling at 50 to 60% of retail and you will give Hanes or any local store a challenge and establish Oak Hollow as regional outlet powerhouse. Closed malls are for the most part, all doomed if they don't start thinking outside the paradigm. High Point U could use one of the former anchor stores for an adult education center. They do need to stop directly competing with their purchase, with all their student on-campus amusements (theater) and eating joints. 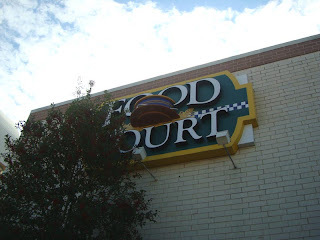 We need to talk about ways to keep the mall and its jobs in High Point rather than maintain and support a website that is based primarily on decor satire and "told you so" negativity. @Anon Oct 31... in defense of the host/owner of the site, he really does paint the reality of the picture and is not sugarcoating anything. 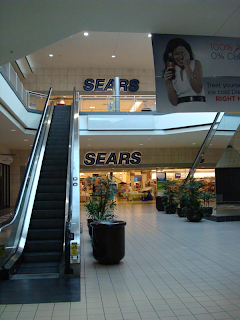 Turn out the lights, the days of the Sears are over. It's on the cutting list. I'm not surprised that a few commenters local to Oak Hollow are are very passionate about this entry. Rereading the news clippings about the mall over the years is like watching a city's heart being broken and ground into dust. You see, Oak Hollow Mall wasn't just going to be a shopping center, it was going to shake loose High Point's inferiority complex and prove that the town was ready to take control of its economic destiny again. One woman who got the pre-opening tour actually cried when she saw the inside of it, because it was going to change everything. Unfortunately, I had heard that exact same line of talk a few years earlier when the Walmart (THE WALMART!) opened. When the mayor is talking to the local media about the vistas of opportunities opened up by a blankety-blanking WALMART, your community is not heading in the right direction, and probably hasn't been for some time. And now, it's another thing that the university owns, which means people assume at some point that it's going to be turned into part of the university, just like downtown has been turned into a string of furniture market showrooms that stand empty for 50 weeks out of the year. The rumored asking price in 2008 was $40 million, and the $9m HPU picked it up for just two years later is still $6m less than the owners were hoping for. 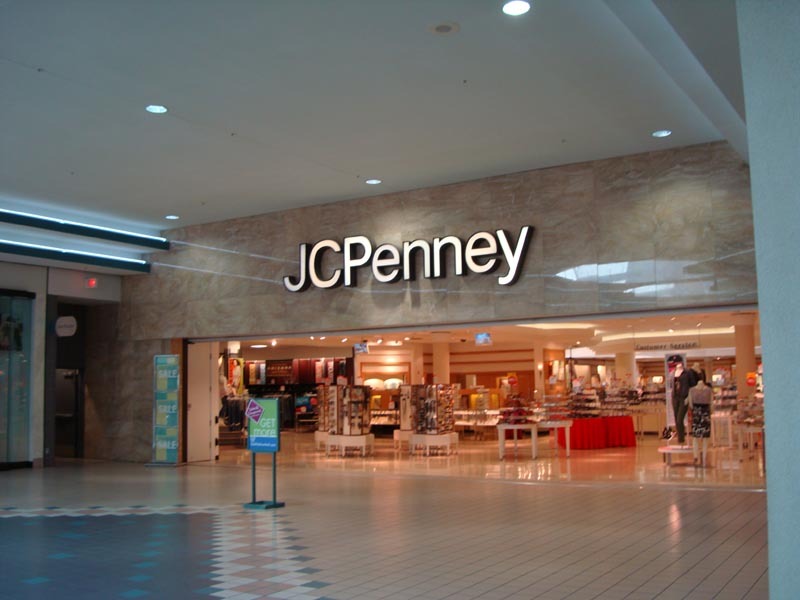 It doesn't help that Penney's and Sears aren't just leaving the mall, they're leaving the city. Walmart really did change everything, just not in a particularly healthy way. They opened up a second store on the south end of town a few years ago, presumably to finish off K-Mart once and for all. @WashuOtaku: The movie theater is still a going concern, although time will tell if that lasts. I'm very sad our local Sears in High Point is closing. 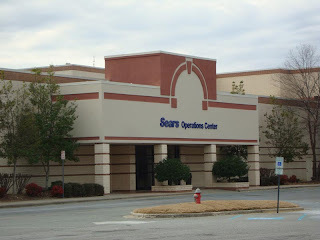 We've been shopping here for years, I guess we'll have to drive to Greensboro or Winston-Salem for Sears now. I hope that the university demolishes the mall and builds a new football stadium and sporting complex ( like they planned to do ). This could attract more business and competition for the powerhouse wake forest. The death of a failing mall can be turned into a triumphant success for hpu and high point. The old days of furniture being the thing here is over, move foreward now quickly before high points economy becomes beyond help. Winston Salem is rapidly removing tobacco industry and replacing it with high-tech industry. They started a little late but not too late. I hope that high point can make the change quickly with hpu leading the way. Please don't let the remember wheners destroy the possibility of high point growing and becoming a city too come see not drive by and say how sad that city died. I myself and everyone in the surrounding triad are wanting this city to recover and grow. Please don't let us down. Great thorough review. I'm surprised you reviewed Oak Hollow Mall in High Point as opposed to Hanes Mall in Winston-Salem or Friendly Center in Greensboro. Any particular reason why? Also, how did you learn so much about the mall, the city, and the previous mall, Westchester Mall? Thanks, Daniel. First off, I try to blog first about the things that have the highest priority. 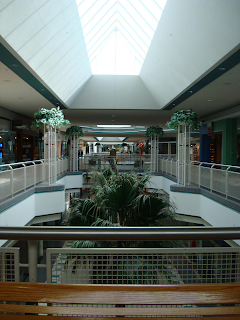 I was tipped off by friends in the area that the mall was in trouble when it still appeared healthy on the surface. 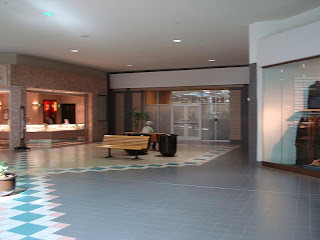 I tend to cover the dead and dying malls before the living ones. This is not because I am necessarily obsessed with dead mallls. I appreciate all significant or architecturally striking retail centers. The fact is that the malls in trouble are on borrowed time and will be substantially modified (repurposed), closed or demolished within a short time frame from when I can cover it. Hanes Mall will likely be around 10 years from now looking much the same. Oak Hollow Mall, however, will likely not look like a mall in the same time frame: possibly even being completely demolished. I am working on compiling photos from the whole area, and will be moving there most likely by late spring. Me, my team and my contributors all do a lot of research to connect the dots with the history of retail in the cities across the Southeast. There is also heightened discussion about topics like the demise of Oak Hollow Mall in the retail forums. 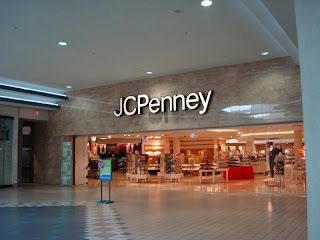 In long term, I will be covering both Hanes Mall and Friendly Center. There is still much more to come. You should have dug deeper the only reason the mall really closed is because the owners couldn't pay for it or so they claimed. That mall was always packed I worked there. The owners got greedy and started making it hard on the retailers forcing them to close their doors. Guess the truth is always harder to find out. You should research and try and talk to some of the smaller stores that had to close their doors first and find out the real reasons. If you could talk to some of the ex employees you would hear the real truth about the reasons why. It all will lead you back to the owners of the mall the crooked lying greedy owners. There's actually been some good retail space projects in HP in recent years (especially on our end of the Wendover corridor to Greensboro)...just not in the places that a certain set of boosters necessarily want it. Since I posted my comment in December, a group of developers have put out feelers about building yet another mall even further north. Frankly, I have no idea what some of these people are smoking. To me, there is an enduring problem with our current Mayor Becky Smothers. Her disdain for the blue collar working man/woman is evident, not only in her words but in her actions that have caused the city to erode to the point it resembles a ghost town. Our streets are crumbling, businesses that others and myself used to patronize are now vacant. Oak Hollow Mall, once a vibrant retail center, is now a barren eyesore. I could go on naming the contempt that Smothers and our council shows the citizens of High Point. And if anyone desires evidence of my accusations, don't ask for words in print but rather take a look around the city. If anyone fails to notice the decay of this city then they are either legally blind or absolutely ignorant of the fact that Smother's leadership is the nucleus of this town's failure. I am a hard working American factory worker who hales from a long line of blue collar workers. I go in to my job everyday and work myself weary. The money that comes from the hours of my labor is spent here in High Point in many different outlets. Groceries, utilities, and what little entertainment we have left in this city. I feel I work against the tide due to the fact that Smothers is diligent in running every decent business out of town as she stomps the working class under her feet, as she has continued to do in the times she has been elected to the office of Mayor. Smothers has done absolutely nothing for the working man/woman here in High Point. Under her corroded leadership, this city has become a crumbling shadow of it's former self while she entertains only the rich and "high class" of this lowly town. I challenge Smothers to open her eyes and realize that it was the working man/woman who really built this city but it is people like her and this "high class" of society that are contributing to it's down fall by thinking of only themselves and their tiny cliques. If this is allowed to continue by voters who blindly support her, then it will not be long before High Point transforms into a social club only for Smothers and her minions. If change does not come soon, then it is apparent High Point is on a course of fading into history. In regards to Goody's, the store closed in the second half of 2004. Steve & Barry's opened in 2005 and remained at Oak Hollow until the company folded in early '09. The news as of late for the city of High Point is that a developing board has finalized plans to refurbish a mile stretch between State Avenue and Ray Street in an attempt to lure businesses, restaurants, and entertainment to that particular section of the city. Nice try High Point, but the move is a little too late to save what is now a decaying city thanks to leadership that is senseless when it comes to running the city as a whole. High Point has allowed both Winston-Salem and Greensboro to advance so significantly that the city itself will always be a secondary location at best. This idea of "recapturing" High Point's vibrant glory days is a nice though however it is one that will fail as other wasteful city projects have in the past. Please High Point scrap this ridiculous idea and save the tax payers money. The city has allowed itself to decline to the point that revitalization is beyond conceivable reality. I was there when Oak Hollow Mall was built. I was a manager of a store from day 1 til 2001. How sad to see it go downhill so fast. I've read some of the blogs about the Mayor and the decline of High Point as a city with interest, but do not know enough to comment. What I did learn from living and working in High Point is that it's citizens are fickle! All I heard was how great it was to finally have a nice mall in HP, while complaining about prices & selection in the same breath. 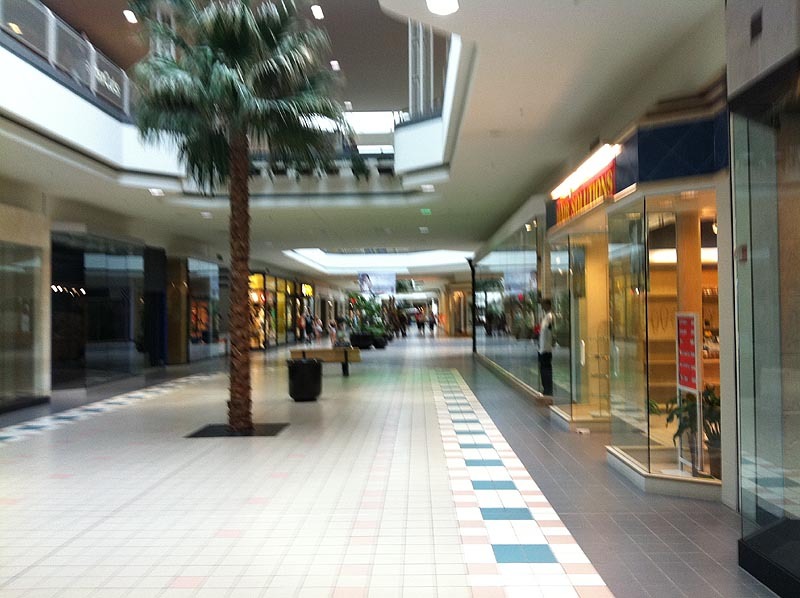 These people continued to shop in Winston Salem and Greensboro at the other malls ,and Walmart, when they could have been supporting their local mall. If anything is to blame for the decline of this once beautiful mall, it's the economy and the people who live in High Point. In reply to above posts, I am very much in agreement that the city government has a lot to do with the decline of the city, and while I will admit it may be a stretch to place all of the blame on Smothers and other city leaders for Oak Hollow's demise, I must say that there are strong indicators of at least a connection. Anonymous October 18, you are right on as well due to pointing out that the fickle citizens share responsibility as well. However, I can understand the fickle quality of High Pointers. Smothers was in office for most of the past twenty years or so and nothing has come from her leadership. Nothing at all. And news of her stepping out of the Mayor's race is welcome to most of High Point's citizens but I do hope that the new mayor will not be a repeat performance of the past several decades. Smothers is not the only mayor to blame as she is only one of a line of failures when it comes to leadership. Just look around the city to see the decay sub par leadership has caused. Not just the mayors of the past but the city council as well. Let's hope this election marks a year of positive change for the city because a change for the better is long over due. I am in agreement with the above posts about the reasons for the failure of Oak Hollow Mall. I was there on opening day myself and I also heard both praises about "the mall we have always needed" as well as concerns on how long the mall would actually last. I have a couple of points that are personal opinions but I feel also contributed to the decline of this once great facility. For one, I was a regular user of the Top Shopper program kiosks that were common place in different locations of the mall in it's beginning stages. At the time, I was a college age individual starting out in life on a tight budget and I found the coupons, discounts, and other benefits offered by Top Shopper to be a distinct advantage to me personally. Top Shopper was also instrumental in introducing me to stores, restaurants, and products that I had never patronized before. And this was also a benefit to the businesses once located in the mall. I understand that with the advent of and greater accessibility of the internet, the kiosks eventually rendered obsolete, however I feel that CBL & Associates could have continued this program in some way on their website or could have created a separate website for Top Shopper. 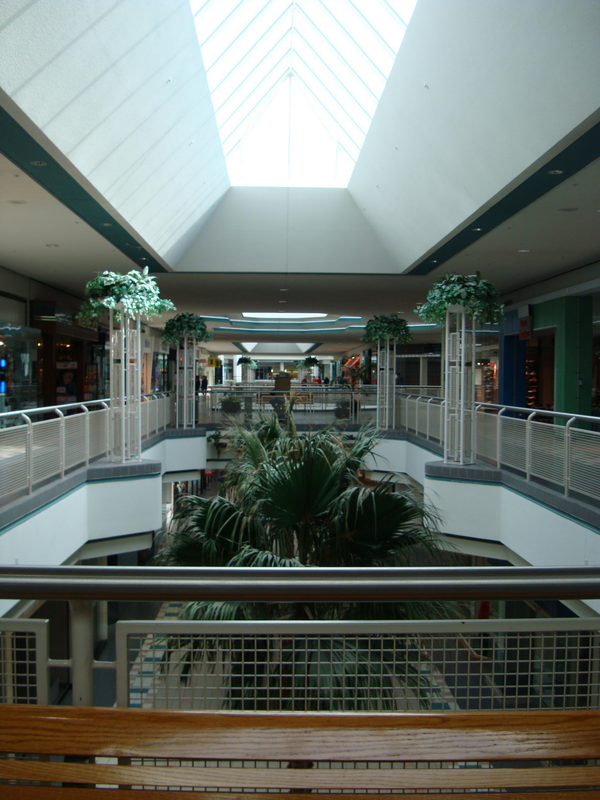 Amongst myself, as well as friends and family, interest in Oak Hollow Mall began to decline significantly when the program was discontinued. It was a fantastic way to peak interest in the mall and it's loss has hurt Oak Hollow. It's just my opinion of course, but it was a factor in looking else where for shopping. Secondly, there was an over saturation of the same kind of shops in the mall. Once there was diversity but as the years progressed, we had multiple jewelry shops (both storefronts and kiosks), shoe stores, and cell phone centers all within shouting distance of each other. And this was another turn off for me as well. As a consumer, I want a diverse selection when I enter into a business but in the waning years of the mall, this was not possible and I feel this led to decline as well. And now we have finally lost the Regal Cinema which just may be the final nail in Oak Hollow's coffin. I hate to see it and the mall go as I have many fond memories there with family and friends over the years. Even though there are businesses that have held on since day one and are still thriving to some length, it may be time for the coup de grâce for this place to end it's suffering once and for all. Yep. They need to bring back Westchester Mall... the perfect size for a mall in High Point. Interesting enough, is that they were planning to expand that mall until the council approved the Oak Hollow Mall proposal instead of the Westchester Mall expansion approval. 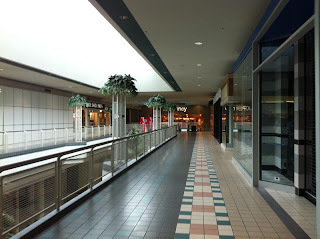 When the mall first open, it was pretty popular. So to say it wasn't, isn't exactly the truth. Around 2008 or so is when Oak Hollow started declining big time. I think it's because the location is no longer relevant and because of the lease rates. Probably because of management also. 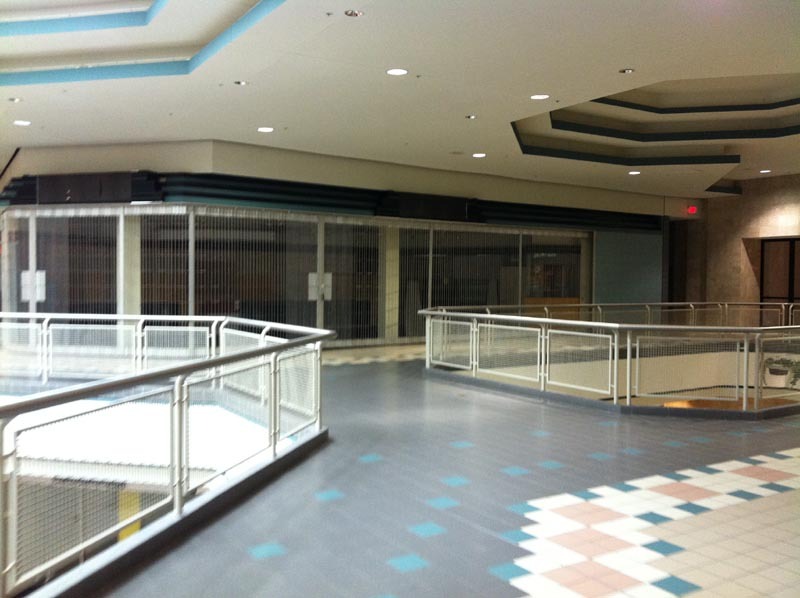 Don't expect this mall to stay open or a resurrection. But no, this mall was pretty popular during it's peak years. In a recent discussion on the subject of Oak Hollow Mall, a point was made that I had almost entirely forgotten about. Apparently, Oak Hollow opened under a controversy that quickly faded, or was intentionally hidden, from public view. Several large anchor stores and a few small shops from Westchester Mall wound up at Oak Hollow, including Will's Books and Gifts. In my conversation with friends, one gentleman brought up the subject of a lawsuit Will's Books brought against the mall due to a reported breach of contract after the announcement of building another bookstore, Barnes and Nobel, on the Mall property. I don't recall any information about the situation but do remember individuals slightly mentioning it around the time Oak Hollow opened to the public. Both the controversy and Will's Books and Gifts soon faded into history along with the conversations. Does anyone on this forum remember this situation clear enough to explain it in greater detail? It would make for an interesting addition to the long history of such a troubled mall. 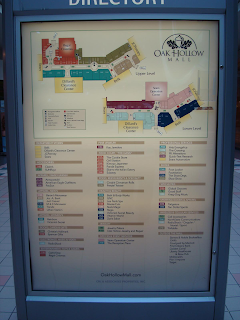 This past Thursday will be the last visit I ever make to Oak Hollow Mall after being a faithful shopper out there since it opened in 1995, mainly because the entire mall has declined even more significantly in the past several months to a year. Regal is gone, leaving the mall in a precarious position which may very well spell the end for this once booming economic center and Belks move in 2014 to the Palladium will take away the remaining customers from the mall as well. The three remaining original occupants are: Foot Action, Bath and Body Works, and Panda Express. I haven't shopped in either Foot Action or Bath and Body Works in years. However Panda Express has been a favorite of mine since day one however it recently is seeing a major decline as their selections of food are not as diverse or as plentiful as they once were. And that fact leaves one to wonder if the end is not near for Panda Express, possibly in weeks or months at the most. I tried to walk through the mall the other night just to remember the good times I have had there with family and friends in it's better years however my trip down memory lane was cut rather short by the presence of individuals who seemed to be up to no good. Security didn't even bother to assist in this situation. Being a gun free zone due to the University's ownership, I took a risk in not being able to carry concealed with my permit in there, so I had to go in unarmed. If you go to Oak Hollow Mall, watch your back because it is becoming a hang out for less desirable types and if you happen to go hungry, then be advised the only remaining restaurant in the food court, Panda Express, is close to it's end due a lack of a great menu selection. Sad to see what this once wonderful location has been reduced to but in all honestly, it's a sign of the times I suppose and it may very well be a clear indication that Oak Hollow Mall is on the verge of closing for good, which based on my observations as of late, may be not such a bad thing after all. Just for the record, Panda Express closed a few weeks ago. Bath & Body as well as Foot Action are the only remaining original stores. This mall is as good as finished. 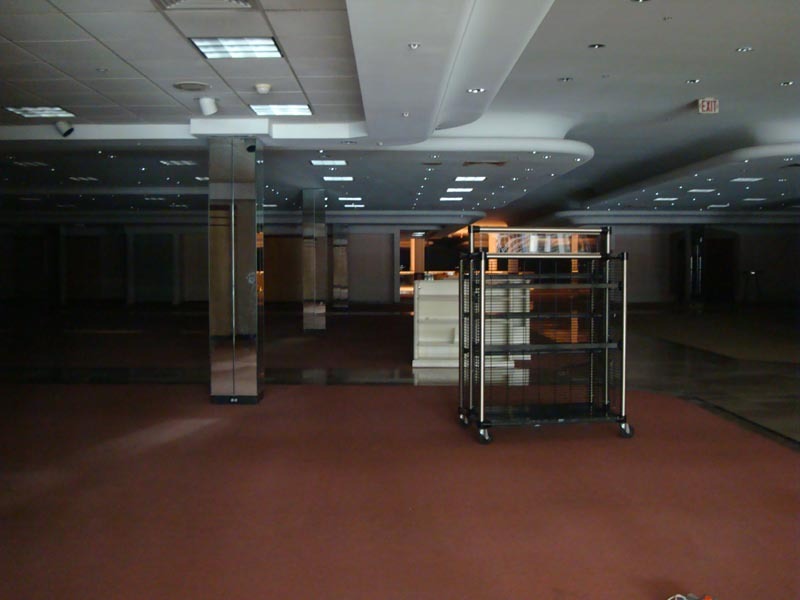 The lights in the mall are still on, but nobody's home anymore. The "you are here" maps apparently haven't been changed in a few years. 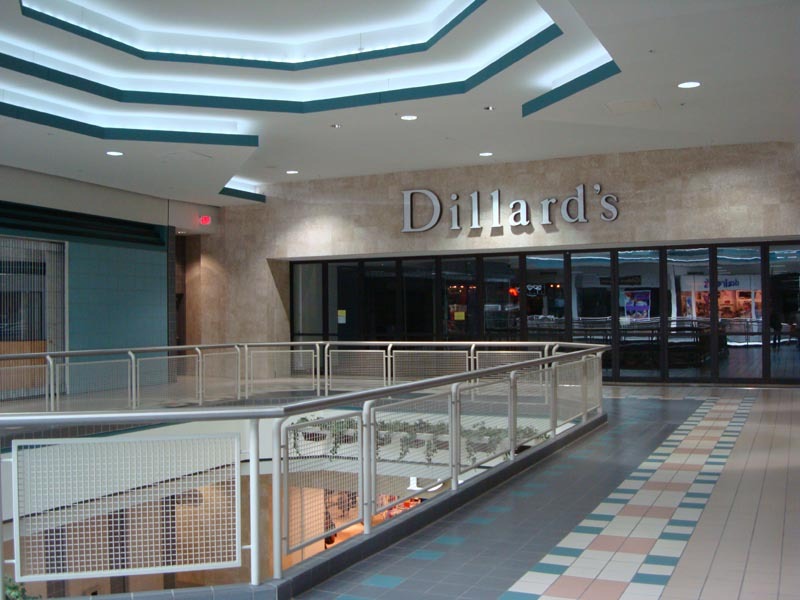 The food court is down to one locally-owned place, and the one anchor left is the Dillard's discount outlet. Belk's made good on its promise to stand by the city; before bailing on the mall they built a free-standing store at a rapidly growing shopping center on the edge of town. Looking around the sprawling development where Belk's finally landed, it would appear that retail might have a future here, but for us the age of the mall is as done as the downtown era. 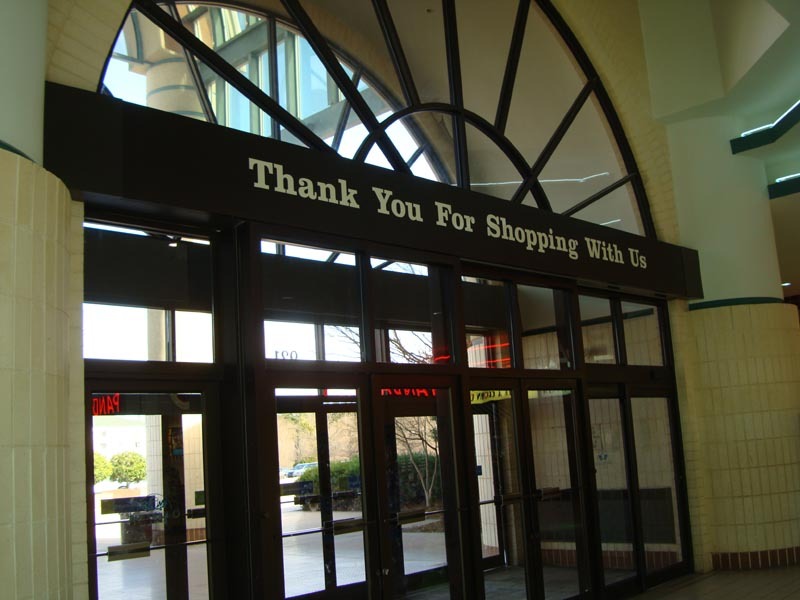 A couple of weeks ago, the Greensboro News and Record announced that High Point University had made the decision to close Oak Hollow Mall as a retail center effective March 10, 2017. As of now, there is no word on if the interior will be open for walkers after March 10. 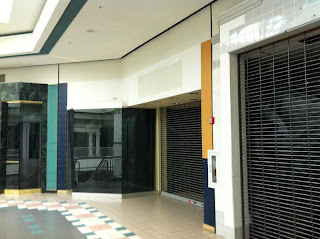 I suppose we can now say that we have lost another mall in the Triad area. 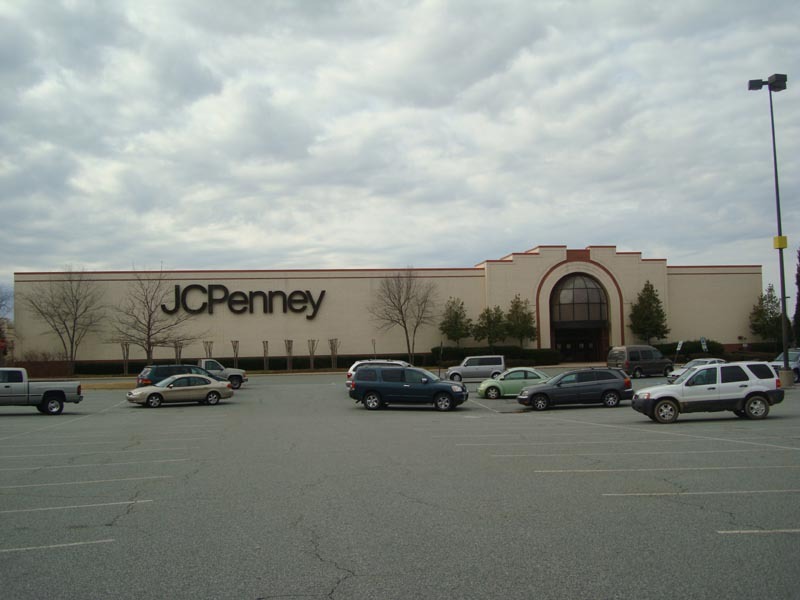 It is the third one we have lost in my lifetime of living in High Point with the other two being Westchester Mall and High Point Mall. Unfortunately, it is officially the end of an era. 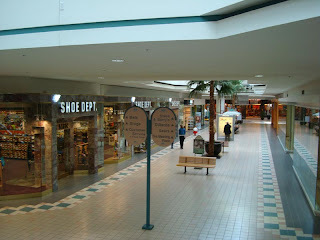 I have a lot of good memories of Oak Hollow Mall over the years with family and friends. It is beyond sad to see it go. 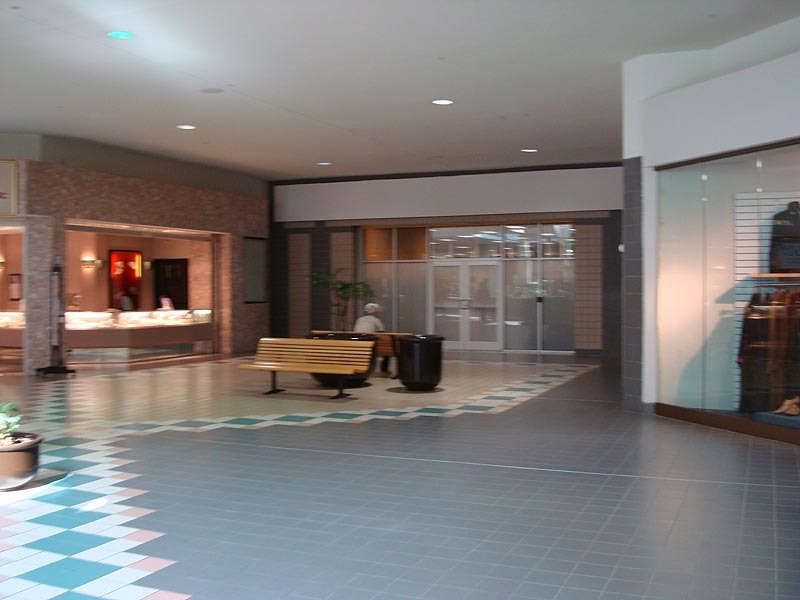 when the mall was at it's peek it was considered a daycare facility, because the kids were being dropped off from opening to closing.